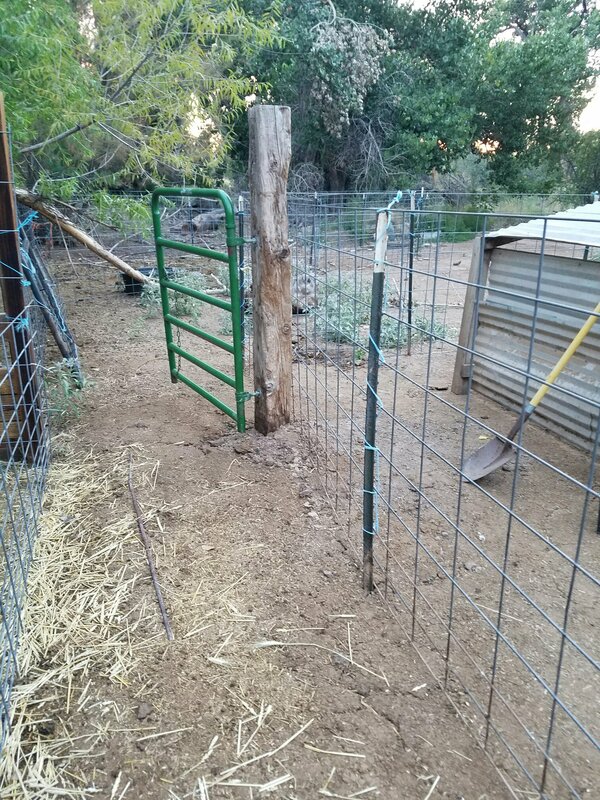 Over the past weekend I finished rebuilding the former sheep pen. Once a new shelter is erected, that pen will be ready for use. I marked off where the 8 foot alley gate needed to be set and ran a string to mark where the front of the two additional pens will lie. 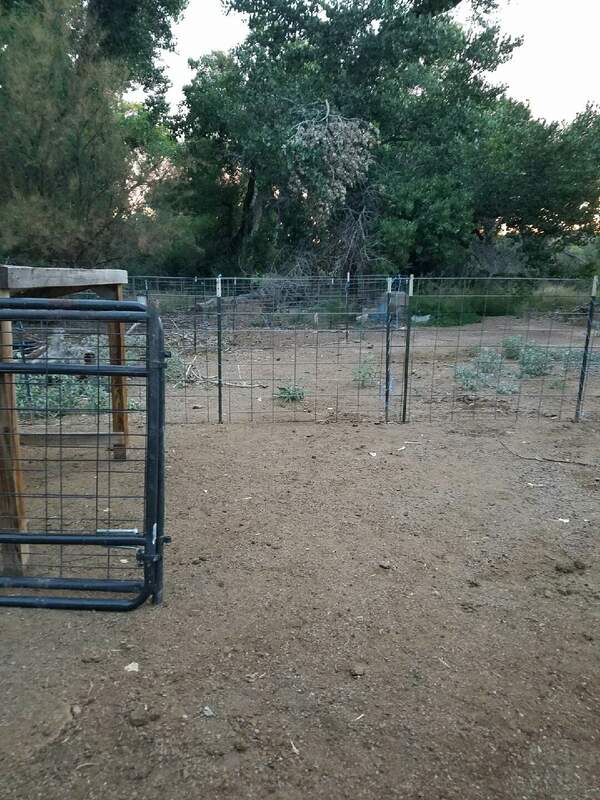 I couldn’t start building those pens until the other shelter was moved from the current goat pen to its new location as I didn’t want to have to maneuver around fencing. Monday evening after work a friend came over and we moved the shelter and brought over the two additional 8 foot gates which will be used for the two new pens. Tuesday evening after chores I strung the remaining lines to mark the two new pens and started setting T-posts and attaching cattle panel. The pens are about half done at this point. I still need to dig holes to set posts for the gate in the alley and the pen gates before I can finish putting up the last cattle panels since those will need to be cut. Other than installing the gates, I should be able to finish putting up the pens by the end of this coming weekend. 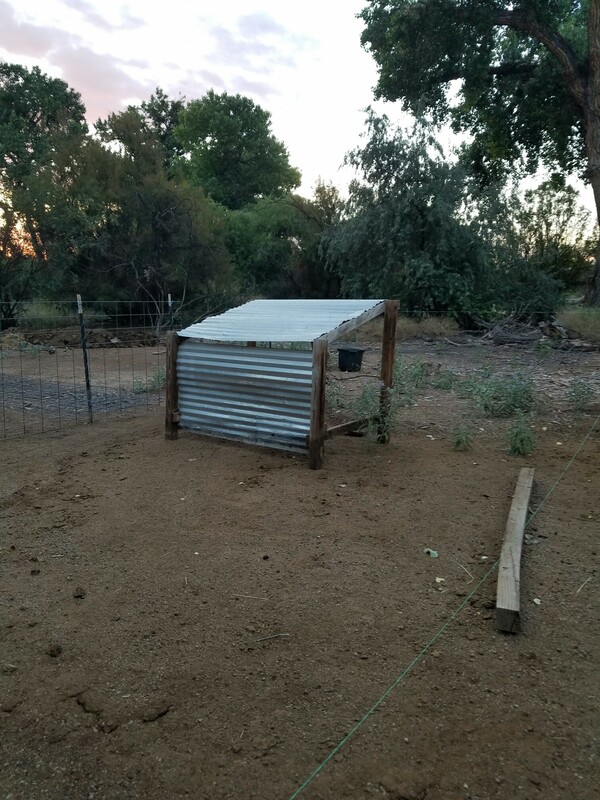 Building the two new shelters for the doe pens shouldn’t take long so it looks like I may indeed make my goal of having the pens constructed and ready for use by the end of this month. As an example of the difference, here is one of the many instances where Tuck has proven himself as a working dog. 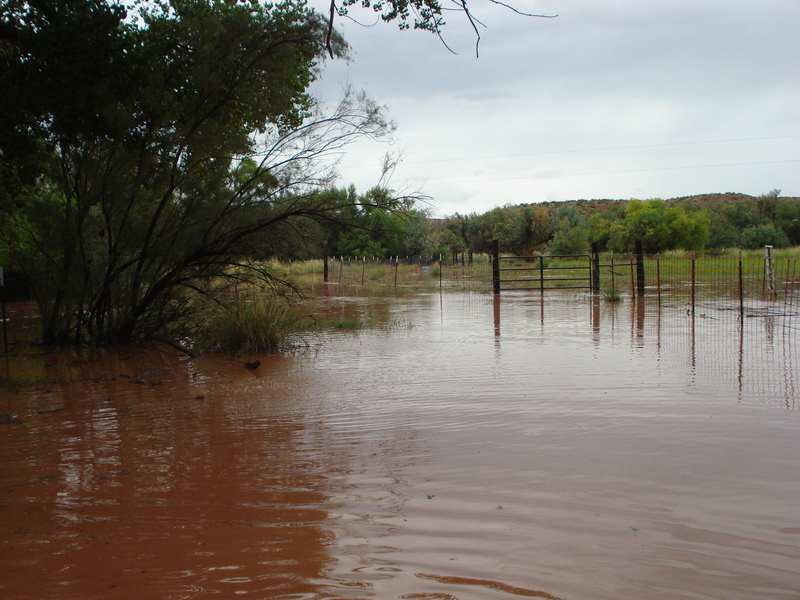 Back in September of 2013 heavy rains caused flooding in my area (see post). 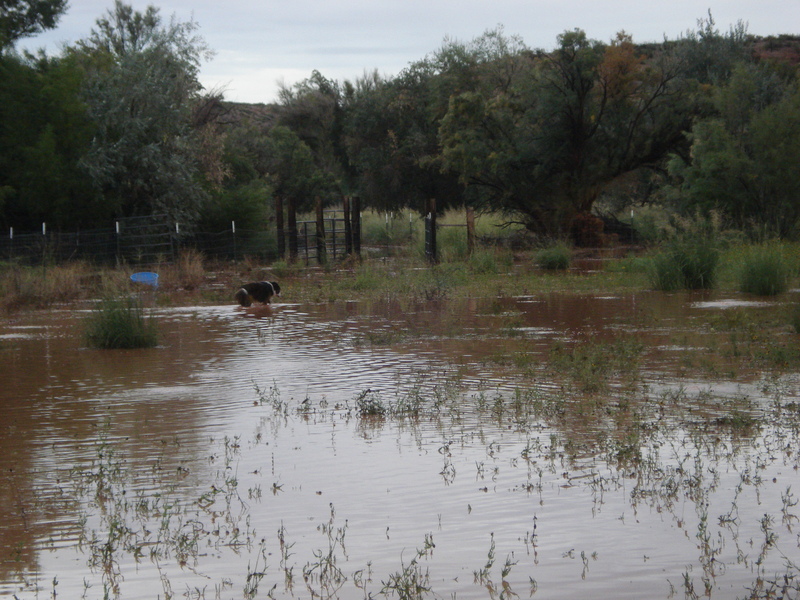 The sheep had been in the east pasture when it started to rain and while Tuck and I had gone out after the rain let up, the depth of water and degree of mud made me decide to leave the sheep out for the night. I received a phone call early the next morning from the post office saying that my order of chicks had arrived. I knew I was not going to be able to get off my property so I called a friend and asked her to pick up the chicks for me and once the frontage road had been cleared, I would meet her at the gate to pick up the chicks. So later that afternoon, after the county road crews had worked on both the frontage road and the county road I live on, she drove over to deliver the chicks. 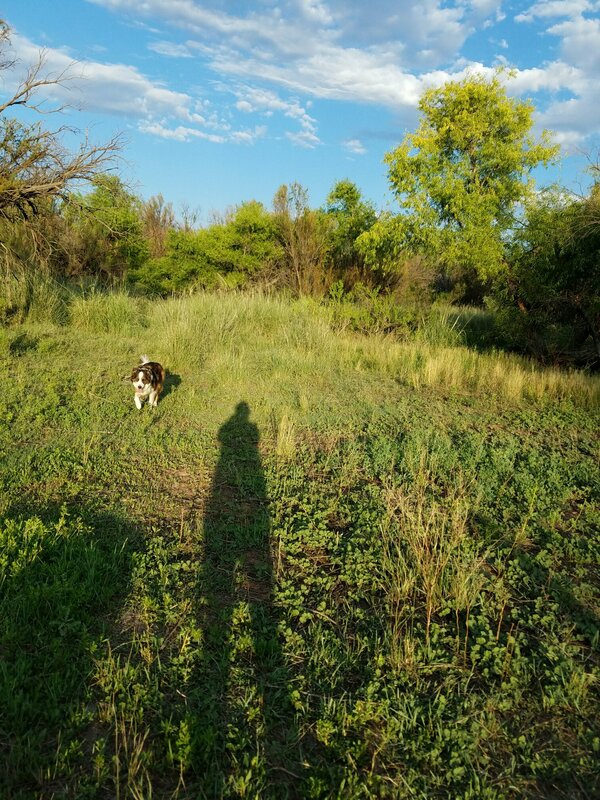 Tuck and I navigated around the cottonwood that had fallen in my drive and waded down the drive (which was still under water) to meet her at my gate. Unbeknownst to me, the road crew had knocked down the corner post (a railroad tie) and the fence in the east pasture along the road was down. As my friend drove up she spooked the sheep that had made their way onto the road and the sheep took off south, around the bend and out of sight. My friend was upset and wanted to know what to do to get the sheep back. I simply told Tuck to bring me the sheep and he trotted off while I stood talking to my friend through the window of her vehicle. In relatively short order, the sheep appeared around the bend with Tuck behind them. He pushed them through the gate and down the drive where I knew the downed cottonwood would block them until I could wade back down the drive with the chicks. 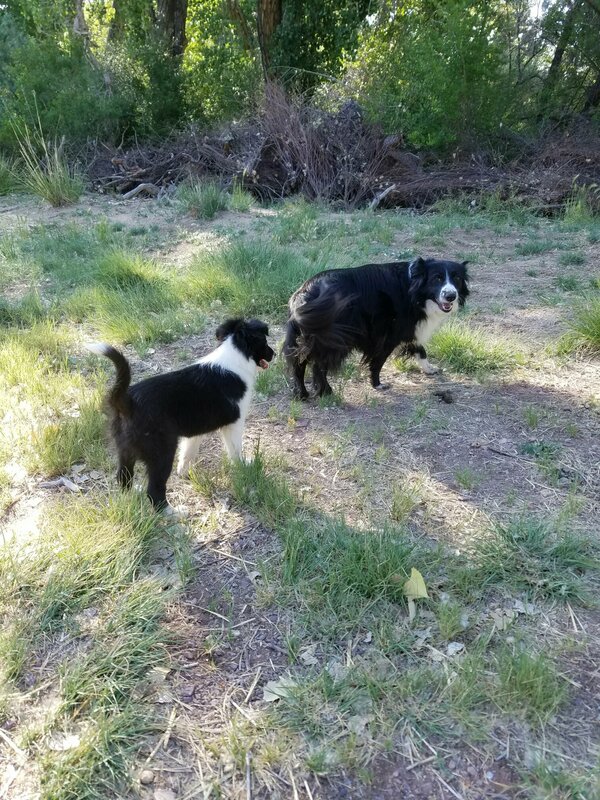 A good working dog does not need to be micromanaged and given constant directions to get a job done. The dog simply needs to understand what the job is and then left to decide the best way to accomplish it. Every day since I returned with the new puppy, Tuck and I have moved the remaining sheep out to the east pasture. The east pasture is probably about five acres and was not used for a couple of years after a road crew took out a corner post and most of the fence along the road. I finally had the fence replaced last summer and was able to use it to graze sheep again but it is still very overgrown. Yesterday morning Tuck and I moved the sheep as usual. Usually by evening the sheep are waiting at the gate to go back to their night pen. Last night, however, when Tuck and I went for the sheep, the sheep were no where to be seen. 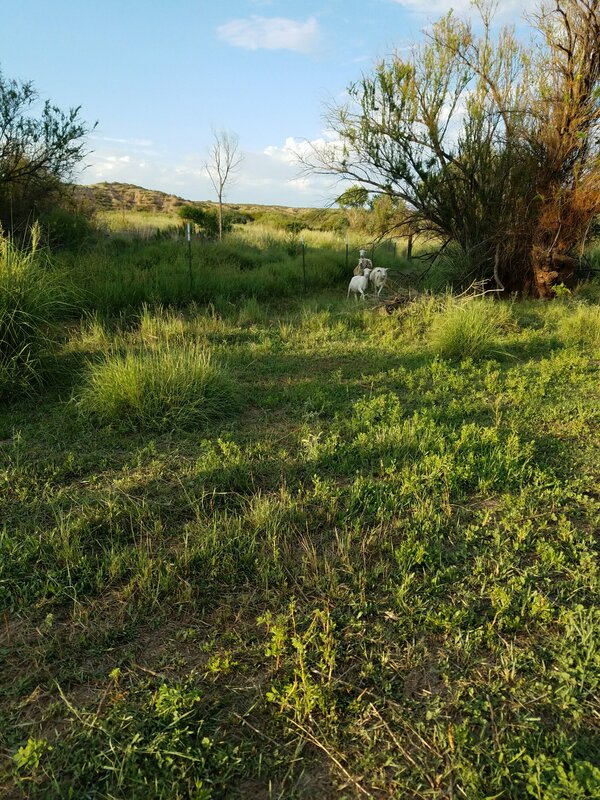 Since I was wearing shorts I wasn’t enthused about traipsing through the pasture looking for sheep so I sent Tuck to find them. Given the terrain, I couldn’t see Tuck or the sheep so couldn’t give him directions other than just to tell him to find the sheep. It took him awhile, but . . . Unfortunately the phone camera isn’t a great way to take photos so I couldn’t get both Tuck and the sheep in the same shot. While I think it is admirable that people want to do things with their dogs and are willing to spend the time and money to take lessons and trial their dogs, don’t ever believe anyone who has a herding instinct title or herding title when they tell you that their dog can work stock unless they can demonstrate that the dog can perform a task on its own without being given direction. 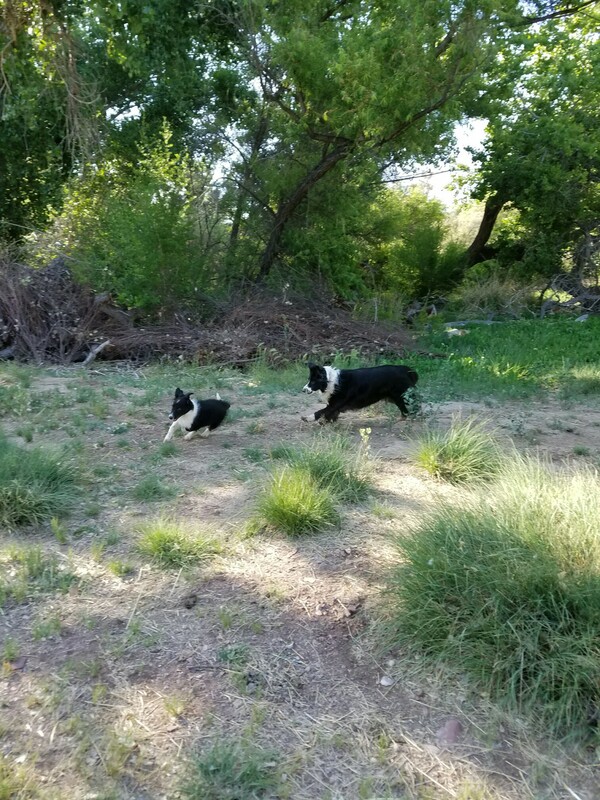 If you need a true working dog look to a breeder who actually works their dog in a similar situation to yours, and not just one who has titles on their dog. 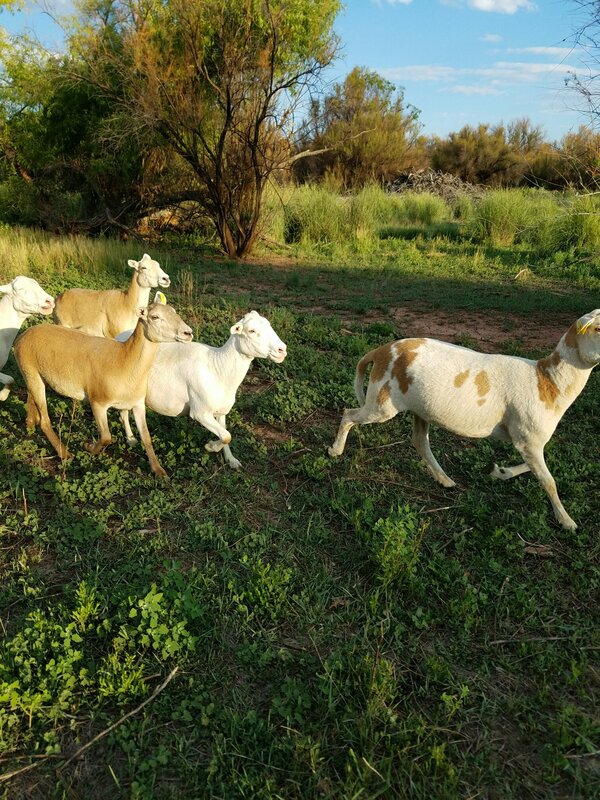 These sheep are trotting – not running – and even so, if I hadn’t been yelling at Tuck to hurry up, he would have brought them up at a walk. Over the past ten years Tuck has proven he is worth his weight in gold (most days) and I’m hoping his great-nephew will be as good, if not better, a worker. Do you want that Super-Sized? This morning when I went out to feed I found a single lamb, plaintively bleating and wandering among the ewes. Each ewe the lamb approached would smell it and either walk away or nudge it on. Across the working pen, a ewe who was cleaning off a lamb would periodically pick up her head and baaa but the lamb ignored her and kept moving on. As a quick glance showed the ewe had a second lamb on the ground I started searching among the ewes to see if I could find one that showed signs of a recent lambing. 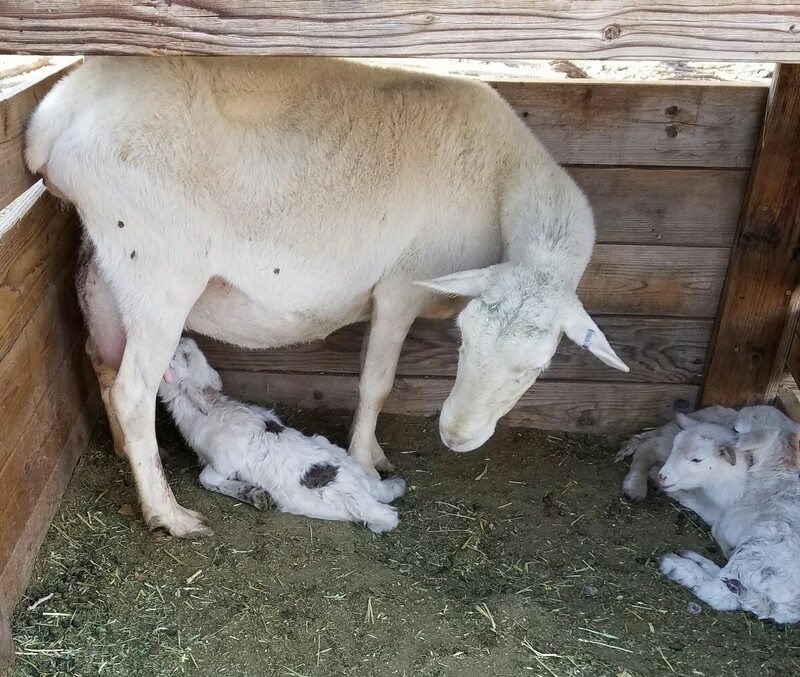 After no success, I decided to see if the errant lamb actually belonged to the only ewe who was showing any interest at all — the ewe with the twins. When I picked up the lamb and carried it to where the ewe and her two lambs were in the corner of the pen, the ewe sniffed the lamb. I put it down and the lamb promptly headed back towards the group of ewes near the gate. The ewe followed the lamb for a few steps but then looked back at the two lambs on the ground and turned back to them. Following a hunch, I picked up the two lambs and headed for the lambing jugs with the ewe following behind. I put the lambs in the jugs and then went looking for the third lamb. I put her in with the trio and then headed to the barn for hay. After feeding chickens, horses, goats, sheep and hogs I had a cup of coffee and then headed out again to check on, and weigh, the new lambs. 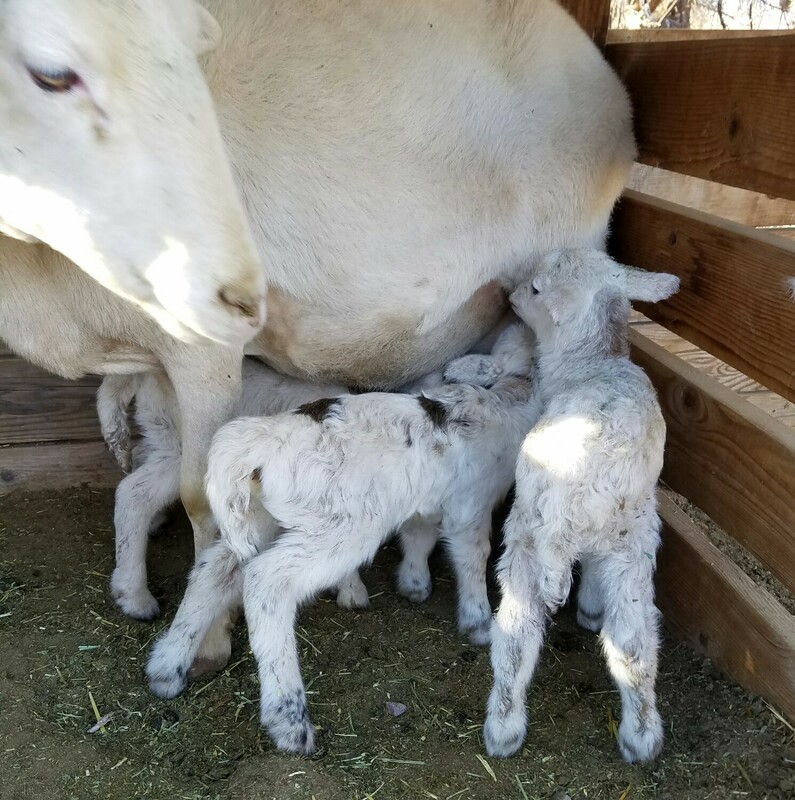 On about the third check later in the morning, I found the third lamb (the largest, BTW) nursing so it appears this “order” was indeed super-sized and the ewe had triplets. Lamb One (the errant lamb) is a female and weighed almost 8 lbs. She is white with a couple of dark brown spots – one at the base of her tail and one on her right side. 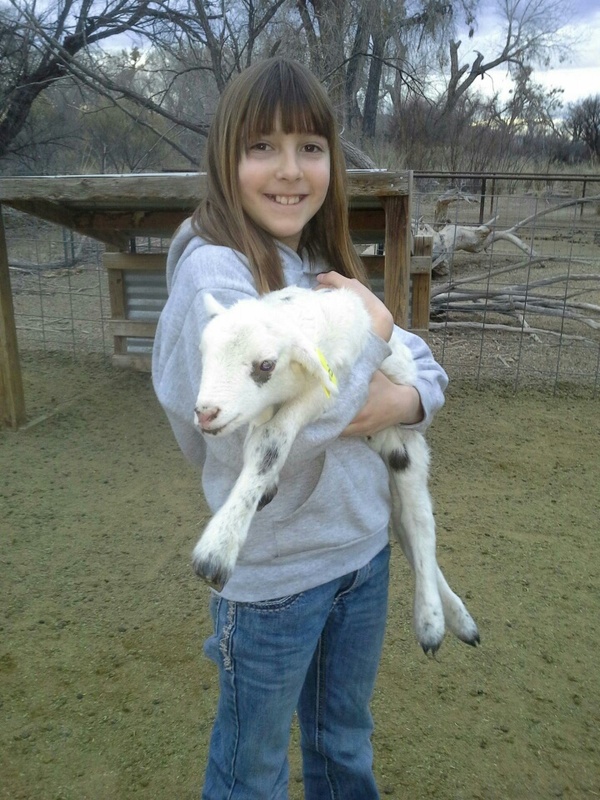 Lamb Two is also a female and weighed about 6 lbs. She is white with brown on her neck and black on the right side of her face. 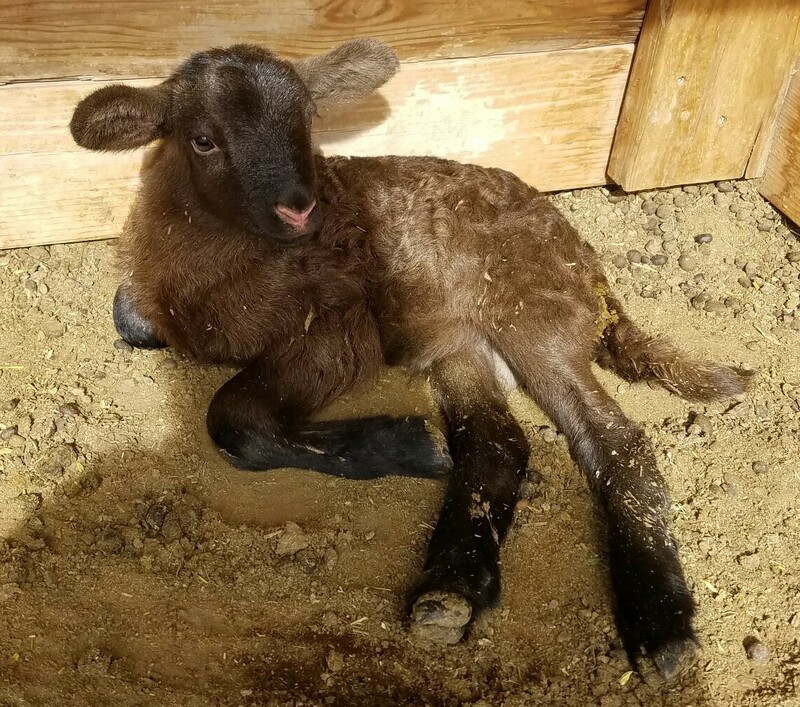 Lamb Three is a male and also about 6 lbs. He is white with brown on his neck. It has been a depressing winter though warmer than usual. Counting 150 days from the introduction of the ram last fall, the earliest date I could expect lambing to start was February 1st. Wednesday morning (the 1st) I went out to feed and found a ewe had indeed lambed. A single ram lamb. I didn’t have time to weigh him, but when I finally did on Friday morning he weighed a hefty 12.75 lbs. I’ve never had a brown this dark before. I wonder if a sheepskin rug can be made from a hair sheep. 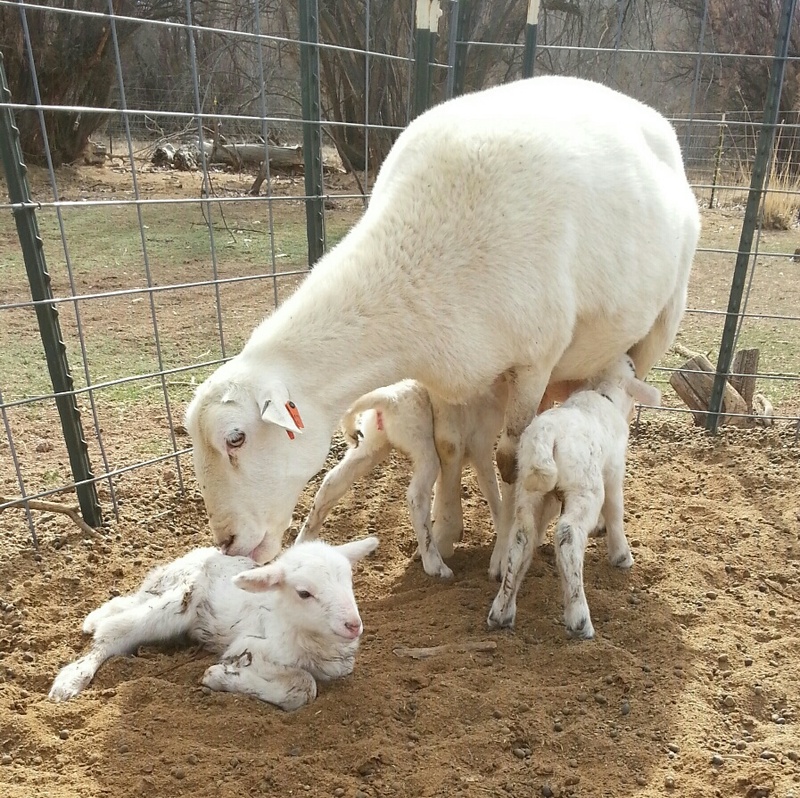 Nothing on Thursday, but on Friday morning my most productive ewe gave me twins. 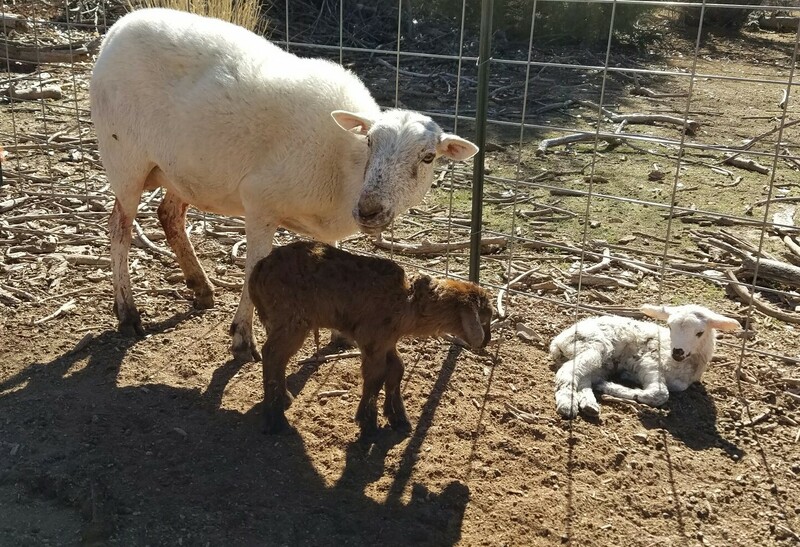 The first born, a ram lamb, weighed 10 lbs, while his twin, a ewe lamb, was a petite 6.5 lbs. 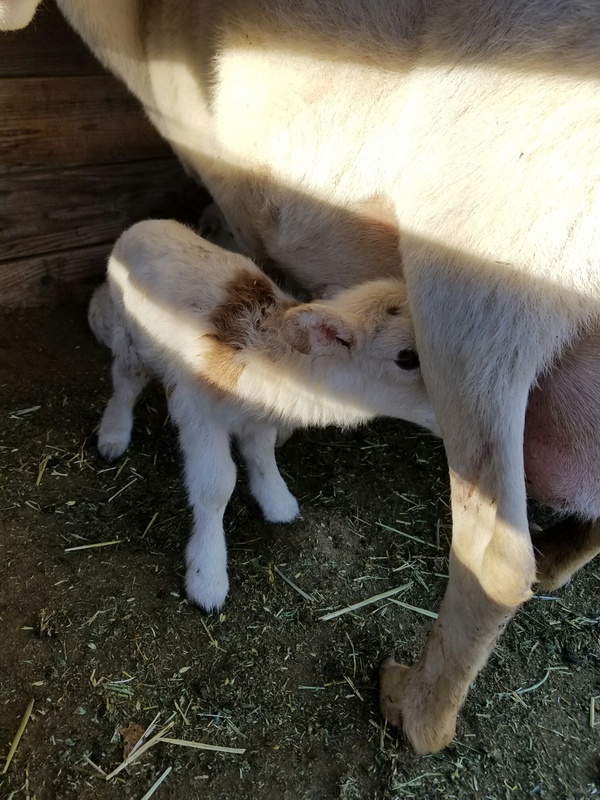 She, however, was the first one up and nursing. Although I was expecting a couple of ewes to lamb sometime last night, neither seemed inclined to get on with business. A ewe who hadn’t been showing any particular signs of lambing delivered twins mid-morning today. 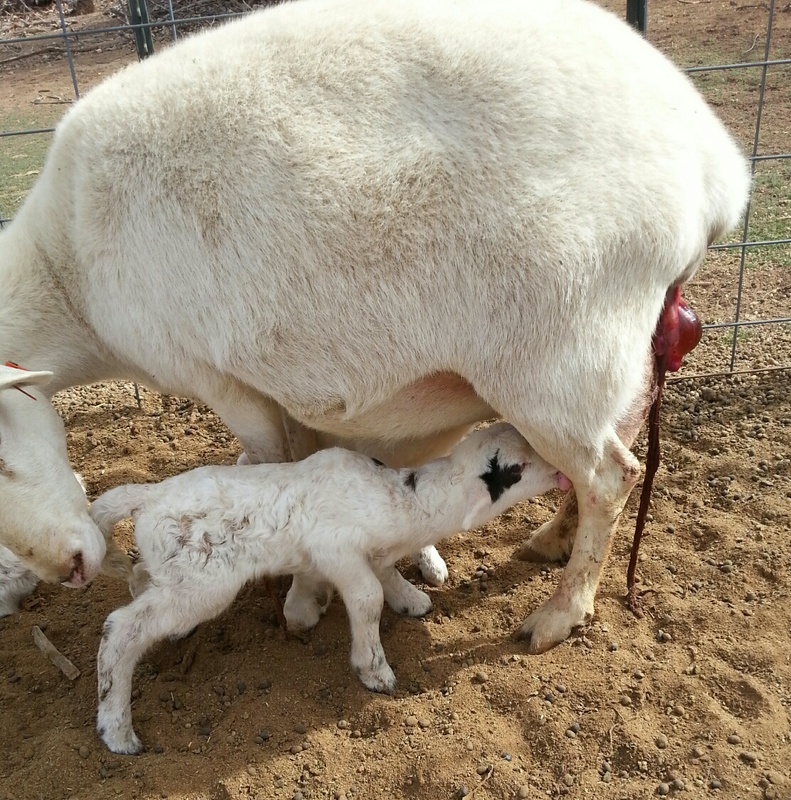 Again a brown ram lamb (9 lbs) and a ewe lamb (8.5 lbs). This ewe is the daughter of the ewe who dropped the first lamb this year. So a good start to lambing this year. A friend stopped by yesterday for eggs and asked about updates on the lambs. While she was able to view lambs up close and personal, for those following the 2016 lambing season, lambing is over. My last two ewes have lambed. The last ewe to lamb was a young ewe that had never lambed before and she gave me a single ewe lamb at a very respectable 10 lbs on February 24th. My final lamb tally was 23 lambs but unfortunately we had one night where the temperatures drastically dropped and I went out to find a dead lamb the next morning. The lamb appeared to be thriving but had a very peculiar bleat so I don’t know if the lamb had a health issue or if it was just separated from the ewe and froze to death. (It was one of the triplets). I’ll try to get current pictures today and post them. Now I’m just waiting to see if the two goats I bred are actually pregnant. Stay tuned. . . .
One of the three remaining ewes lambed on the 17th and gave me twins (both ram lambs), bringing my total up to twenty lambs – ten female/ten male. Since the highest guess on the contest was 19, I had a friend (who did not participate in the contest) do the random draw and the winner of the contest has been notified. All twenty of the lambs have now been ear tagged and wethered (if male). Here are some random photos. 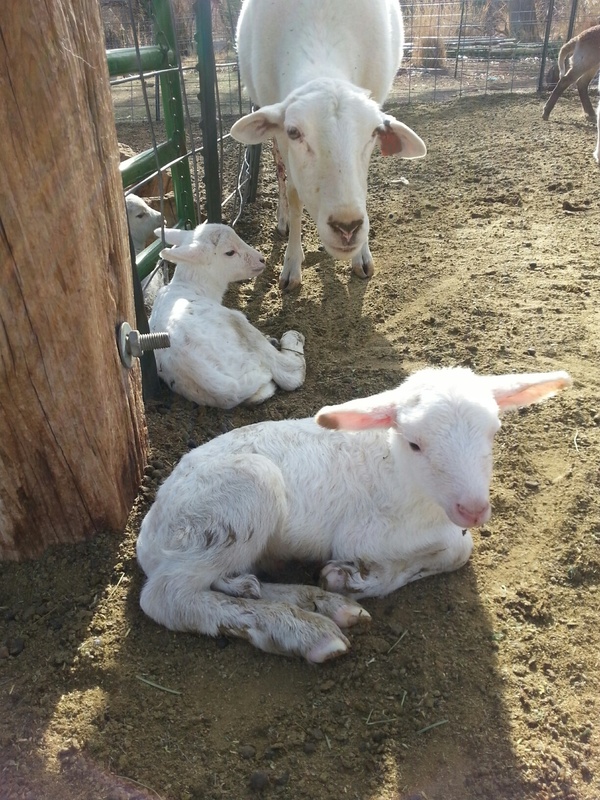 I thought one of the ewes was in labor Saturday but no lambs. Sunday she was again showing signs of being in labor but again no lambs. I worried all day Monday about her, especially given the size the lambs have been so far this year but when I got home, again no lambs. Early this afternoon, however, she finally decided she had had enough and I went out to find her cleaning off a lamb. 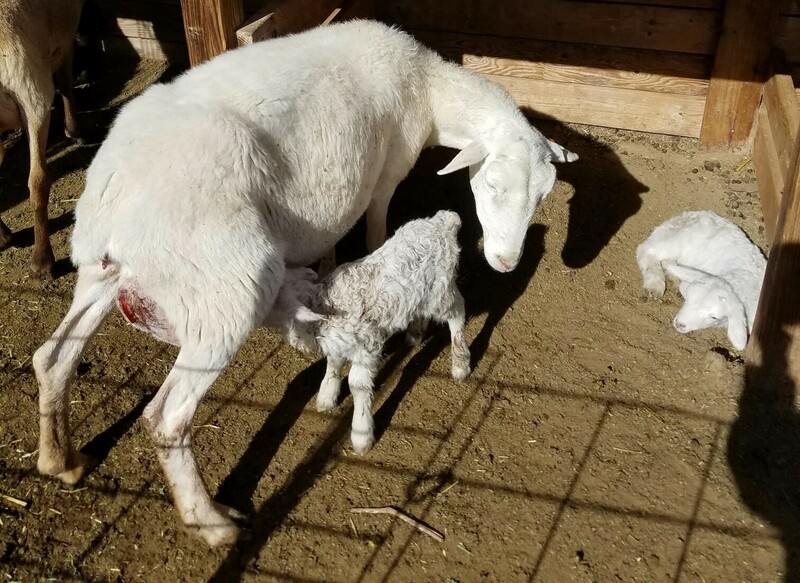 The lamb looked much smaller than any of the other lambs but it seemed fine – up and trying to nurse while the ewe was alternating cleaning it off and pawing and circling, signs of another lamb to come. In short order, a second lamb was produced and I went in to let the ewe clean off both lambs before I weighed and dipped cords. 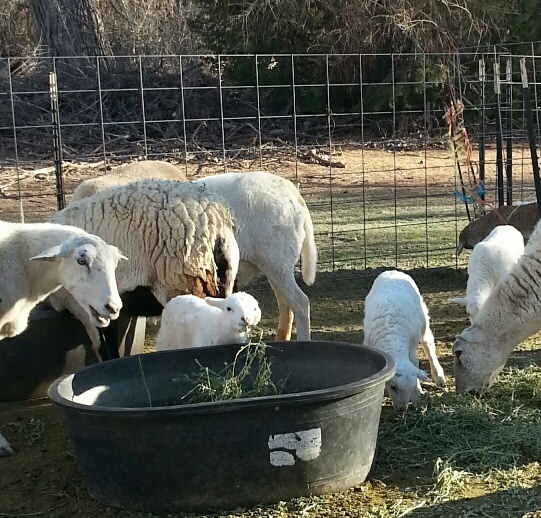 When I went back out, the ewe was still exhibiting behaviors I associate with lambing. While I was observing her, she circled around and I saw two hooves – but back hooves and not front ones. I applied gentle traction and a third lamb slid out into my hands. I let the ewe clean off the third lamb while I weighed and dipped cords on the first two. Lamb one was an 8 lb ewe lamb and the second, also a ewe lamb, weighed 9 lbs. Lamb three was three for three, but 10 lbs. 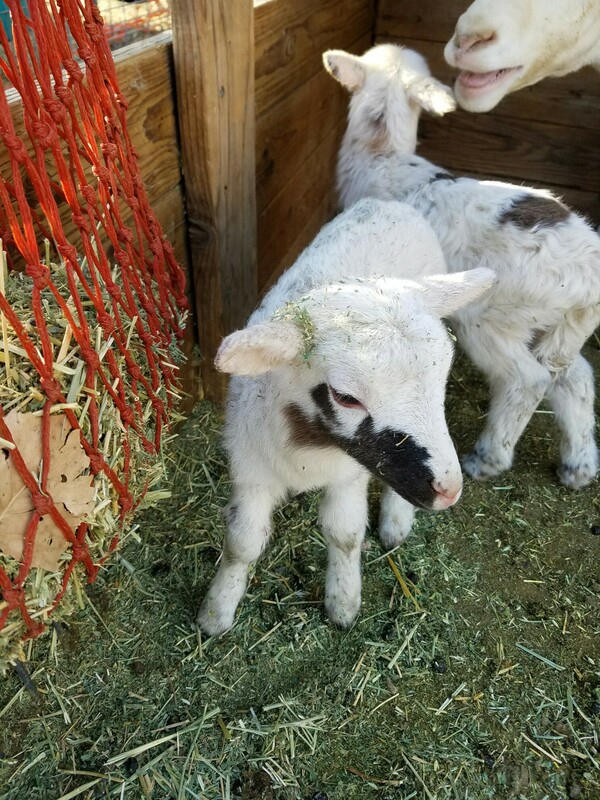 In keeping with this year’s tradition of color, lamb 2 has two small black spots on her neck/shoulder and a small black patch on her left eye and larger black patch on her right eye. So while I was weighing lambs, another ewe delivered a lamb. 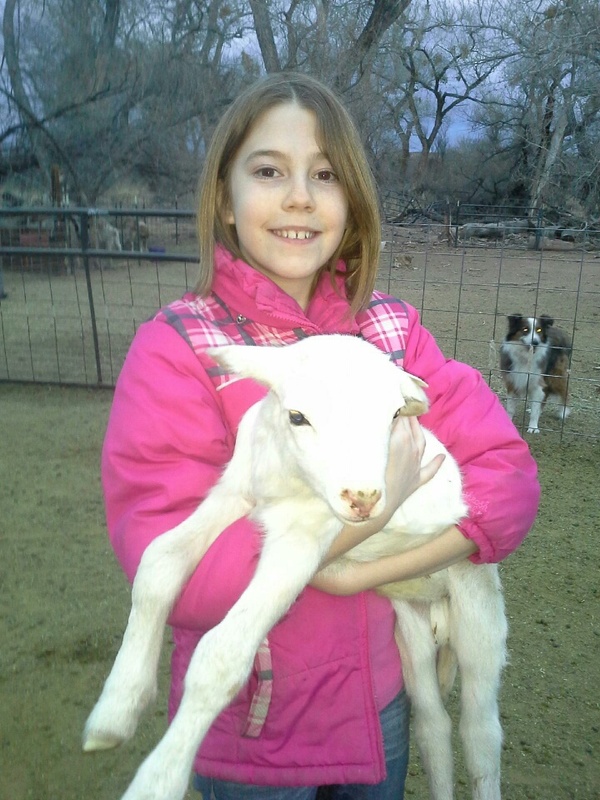 After a delay, she also had a lamb present backwards. Her lambs were both ram lambs, weighing 10.5 and 10 lbs. All but three ewes have now lambed with 18 lambs on the ground. Ten ewe lambs and eight ram lambs.